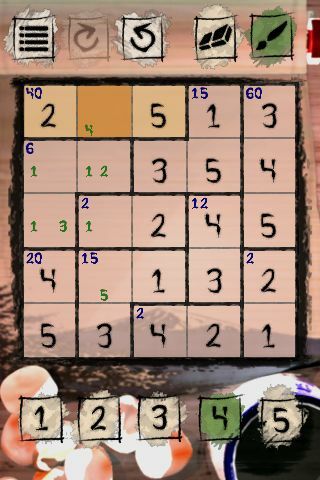 KENKEN captures the fun of a Sudoku logic puzzle and augments it with arithmetic making it a great game to support learners as they build fluency with basic facts and mental math as well as develop logical thinking skills, problem solving strategies and perseverance. There are 3 versions of KENKEN on the AppStore - and the are all based on the same puzzle – here I am focusing on the $0.99 version by Capcom. In a nutshell you are presented with a grid ranging in size from 3x3 to 6X6 (up to 9X9 on paper versions) and like Sudoku you are challenged to place a numbers in the cells so that no row or column contains any duplicate numbers. 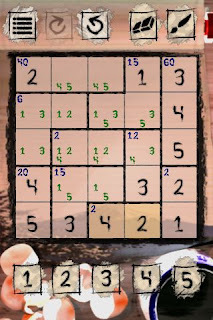 The unique twist with KENKEN is that the grid is broken up into a series of cages (connected cells marked out with bold lines) which are marked with a goal value and an operation (left out in the hardest cases). The challenge is to make sure that the numbers used within a cage combined with the operation produce the goal value. As you complete your first 3x3 grid, KENKEN may appear to be quite easy – but very quickly you will find yourself drawn in to puzzles that are very challenging. Make sure you make use of the note feature to keep track of plausible values in each cell to support you in your puzzle solving endeavors. The options page allows you to manage the music, change the visual theme (all of which are visually appealing and not too distracting), reset the game and choose a language (English, French, German, Italian and Spanish). The quick-start ‘how to play’, rules, control descriptions and other help features are an easy read and straightforward. Although players can start right away with a few free-play puzzles at any level, they need to go through the academy to unlock each of the levels before they will have access to all of the puzzles. Guess and test can be a good way to start, but players (you and/or your children/students) will get a lot more out of the puzzles if you have an opportunity to think through and talk about the choices you are making and elaborate on your strategies. Look for a KENKEN buddy, use a notebook, or work in a group. When working with others, ability levels don’t need to be the same. Like-ability players can be very productive in co-generating strategies, but unlike-ability players will also benefit from collaboration. The ‘masters’ will benefit from thinking through, articulating and explaining their strategies, and the ‘strugglers’ will benefit from being able to ask questions and having a buddy to check their moves, provide clues and guide them when they are stalled (preventing excessive frustration). I suggest that if you find that you (or your children/students) are getting too frustrated by puzzles at a given level, then you might back up to the preceding level, review the strategies again and practice some easier puzzles. Success with appropriately challenging puzzles will breed motivation and encourage perseverance – but too much frustration is not helpful. The app takes 5 seconds to load on a 2nd generation iPod Touch – if removing the (non) talking head would reduce this by 1 second it would be worth it. The numeral 4 is a bit difficult to read in the markers and totals – the tall stroke shouldn’t diminish in the middle above the horizontal stoke. Accomplishments are tracked for only one individual and only by game board – it would be nice if there was an easy way for a parent or teacher to easily review the progress of multiple players. I recommend this game – both as an entertaining pastime and as an educational tool to support the mastery of some basic facts (see note above about improving this) and mental math skills along with encouraging logical thinking and problem solving.